Science Fiction and Cultural Theory: A Reader is an essential resource for literature students studying science fiction, science and popular culture, and contemporary theory. This book combines key theories that have become touchstones for work in the field with more recent thinking to showcase how theoretical paradigms central to science fiction such as posthumanism and mediation have become central to critical theory overall in the twenty-first century. Each part will not only to outline the central critical trends in the study of science fiction across media but will also to show dialogue and exchange as these concepts are refined. Each section will conclude with a list of recommendations for further reading. 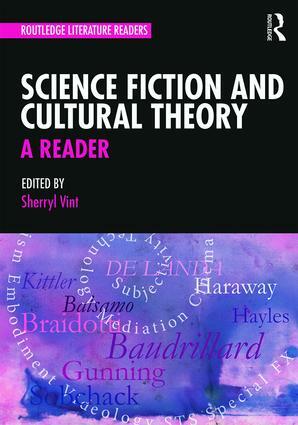 In this volume Sherryl Vint brings together the most important critical essays and approaches to the study science fiction over the last 40 years to create an ideal resource for classrooms. Sherryl Vint is Professor of Science Fiction Media Studies at the University of California, Riverside, USA. She is the author of Bodies of Tomorrow (2007), Animal Alterity (2010), The Wire (2013), and Science Fiction: A Guide for the Perplexed (2014). She is the coauthor of The Routledge Concise History of Science Fiction (2011), and coeditor of The Routledge Companion to Science Fiction (2009), Fifty Key Figures in Science Fiction (2009), and Beyond Cyberpunk (2010). She is an editor of the journals Science Fiction Studies and Science Fiction Film and Television and is a recipient of the Science Fiction Research Association’s Pioneer Award.